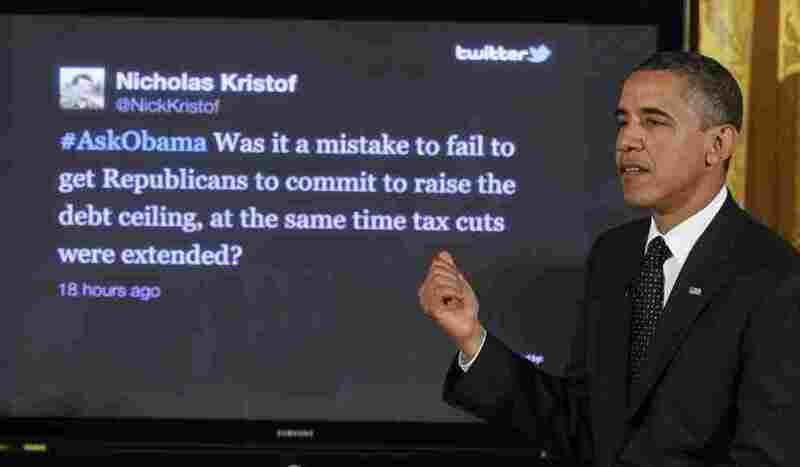 Obama Sidesteps 14th Amendment-Debt Ceiling Query At Twitter Town Hall : It's All Politics Obama's "I don't think we should even get to the constitutional issue" is not the same as "no." He clearly doesn't want to get there but it sure sounded like he was keeping all his options open, including what some are calling his nuclear option of just ignoring the ceiling.That would trigger a constitutional crisis even if it averted a default crisis. President Obama at a "Twitter Town Hall" at the White House, Juley 6, 2011. One of the most intriguing answers President Obama gave at his Twitter town hall on Wednesday was actually a non-answer. To the tweeted question of whether he would invoke the 14th Amendment to ignore the debt ceiling as unconstitutional should he be unable to reach agreement with congressional Republicans, President Obama never said never. ... There are some people who say that under the Constitution, it's unconstitutional for Congress not to allow Treasury to pay its bills, and are suggesting that this should be challenged under the Constitution. I don't think we should even get to the constitutional issue. Congress has a responsibility to make sure we pay our bills. We've always paid them in the past. two weeks, that Congress, working with the White House, comes up with a deal that solves our deficit, solves our debt problems, and makes sure that our full faith and credit is protected. "I don't think we should even get to the constitutional issue" is not the same as "no." He clearly doesn't want to get there but it sure sounded like he was keeping all his options open, including what some are calling his nuclear option of just ignoring the ceiling. That would trigger a constitutional crisis even if it averted one of the default variety. On All Things Considered, Melissa Block talked with Jeffrey Rosen, a George Washington University law professor, about the post-Civil War history of and current debate about the 14th Amendment. Rosen doesn't dismiss the possibility the 14th Amendment could loom large in a few weeks if the president and Congress don't reach a debt-ceiling deal before the Aug. 2 deadline when the government will have run out of accounting tricks to avoid a historic debt default. "It could have political consequences. We shouldn't for a moment dismiss the possibility that serious constitutional arguments about clauses that haven't been thought of for a long time can transform political debates. Bush v Gore, in the health care argument, these are cases where the constitutional arguments were made up on the fly. That doesn't mean they're not plausible. "The truth is that the situation today is similar although not identical to the one that confronted the nation after the Civil War. And the arguments on both sides are strong, plausible and deserve to be debated in the public arena."